I let the kit sit for a few days to let the adhesive really dry (also, because I was too busy to get to it). I then mixed up some Bondo automotive filler and applied it to all the seams and screw heads. 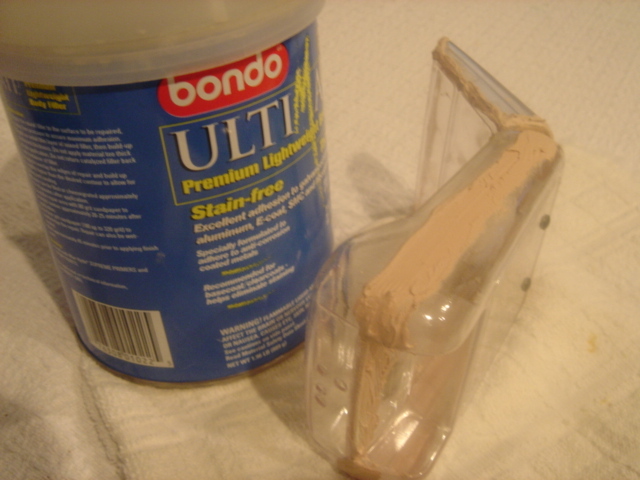 Be careful not to over-do it, as the Bondo takes quite a deal of sanding to remove, and any unnecessary material will be a pain to sand down. 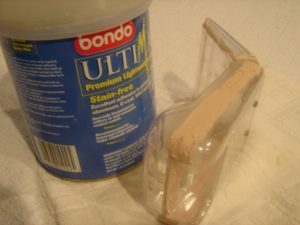 I let the Bondo cure over night. Afterwards, I gave the Bondo a good sanding with 150 grit paper. This removed any “Bondo-burrs” . I then worked my way up from 200 to 450 grit paper, which helped blend the Bondo in with the rest of the tricorder.